Today was laundry and cleaning day. Trying to get caught up from all of our travel. Evening is approaching and my home is feeling a bit more orderly. A bit more peaceful. I did take a break from housework and covered a paper mache box with fabric. I love working on small projects. Don't you? This sewing box is for the contest. I collected some things at market and thought it would be fun to place them in something sweet for you. For you gals overseas....you don't have to worry. We are glad to ship things to you too! I covered this box with some fabric from our Nell's Flower Shop line. (One of our older fabric lines.) This large floral print seemed just right for a sewing box. The inside is covered with paper. When covering paper mache boxes with fabric or paper I use PVA glue from Paper Source. The fabric and paper lay smooth and flat with this bookbinding glue. Market treats are collected inside the box for you. A small vintage French floral applique. A charm pack of our new fabric Old Primrose Inn. Vintage baby blue rick rack. There was a great company selling metal findings at market. The copper colored bird was purchased from them. 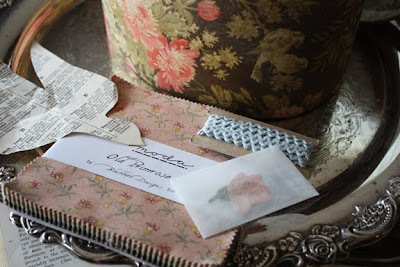 A bit of vintage pink ribbon. A small muslin bag with several buttons and a sprig of the lavender grown in my garden this summer. The pattern on the left is a needle keeper from Bonnie Sullivan. Bonnie and Kathy are sisters. They are planning to begin cross stitch designs. Barb and I can hardly wait to see their new patterns. They will be showing at the Nashville Cross stitch market hopefully. Click on Bonnie's name to go to her web-site. I was only able to make one sewing box today. I will be making a couple more boxes....each will be unique. So there will be 3 winners in this contest. Leave your name and good luck! Cut off is Friday at midnight. Also please only leave one comment per person. The winners will be posted on Saturday. Kay from The Rabbit's Lair in Roger's AR sent a photo of their Warm Hearts block of the month project. Click on the store name for more information. This quilt was designed by Barb and published in our Warm Hearts book. I'm now out of the book.....all have been shipped to The Rabbit's Lair. Love the box, please enter me in the drawing for one!! Also, did Kay happen to mention that the MAKER of that beautiful quilt was none other than Kay herself? It is just stunning up close and personal. The box is wonderful. Would love to win one! What a gorgeous quilt! The box is gorgeous and the goodies inside - oh, so fun and lovely - hope I'm a winner!!! Stunning quilt and beautiful goodie box! Thanks for all of the inspiration! Alma you are such an inspiration! Who would have thought a plain box could be turned into something so cool! I'd love to be in the drawing for your lovely sewing box and goodies. What a beautiful job you did with the box! The goodies inside are icing on the cake!!! Oh what a beautiful box. Can't wait to get hold of some of your new fabric also. Would love to win one of your gorgeous boxes of treasures. Please include me!! All very cute, as usual! Please enter me. Please add my name to your drawing. Thanks so much! How lovely, please enter my name! That is such a pretty box! You are so sweet to do another giveaway...here's keeping my fingers crossed! Please enter me-the box is beautiful! If I don't win, I'll have to make my own box. Thanks for the tip on glue to use. As usual, beautiful things to look at on your blog. I love the box and the treasures and I would love to win it. I would love to win one of your boxes--please add my name. 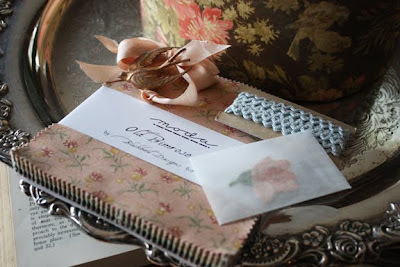 I love the idea of covering a box with some favorite fabrics. It will be a way to savor the fabric long after the quilt is given away. I'd love to win the one that you made. Oh my goodness. Wonderful goodies. Love the beautiful quilt! I'm glad market went well for you and that you are home safe and sound! Thank you for hosting such a lovely give-away! What fun to forage at market and find such wonderful goodies to go in such a fun box! VERY excited about the book coming out next! Thanks for the opportunity to share with you! What a wonderful sewing box. That is a beautiful BOM. The sewing box in itself is a wonderful goodie. And everything else in there? Fabulous!! Would love to win one of those treasures! I love the box and all the goodies. Please enter me !!! Thanks, April in an Boat floating in all our Alabama Rain !!! The basket and goodies are beautiful. I would love a chance to win this. Thank you! Beautiful box and wonderful treats inside. thanks for the glue tip. What a beautiful box and wonderful collection of things in side. Please enter me in the draw. Love the quilt. - Sandra. The goodies inside aren't bad either! I just love the covered box! I hope I win-we all say that don't we! The quilt is beautiful. How wonderful for the winner to have not only some super gifts but a handmade box from you! I'd love to win! Oh what treats! I would love to be picked for something like this. Boxes, birds and ribbons, oh my! This box is adorable!!!! I would love to enter!!! Thank you soooo much!! The box is beautiful! Please enter my name in the drawing! How exciting a new drawing for a lovely sewing box. Pretty things! Please enter me. Oh I just love that beautiful sewing box with all those goodies. I would like to be entered. Many thanks. Beautiful! I hope you had a successful market. Please enter my name in your drawing. Thanks! I'd love a chance. Thank you! Yes, please enter me in the drawing for a lovely box! Love the box. Please enter my name in the drawing for one. Please enter me in your drawing. I love that box. Thanks! So lovely! Please count me in! Truly sweet and lovely selections of goodies for in the box. I just bet the fragrance of the lavendar when it gets opened by the lucky winner (could it be me?) is intoxicating! Ohhhhhhhhhh...I could be SOOOOOO tempted to follow along on THAT BOM! The colors remind me of dark chocolate covered cherries! YUMMY! The box is fantastic. I love the pink & brown theme--it's the color of the quilt I'm currently working on. OHHHH LOVE the box and all the goodies! You are no less that Just FABULOUS! Going to order my glue! Absolutely love the box, and everything you have in it!!! Would love an opportunity to win this! What a generous offering and so heart-felt too! Gorgeous! I have a bundle of Nell's Flower Shop in my Moda cupboard. I may have to go dig it out! Gorgeous box! ...and the goodies inside are yummy! Please enter me in your giveaway, thanks. I would be thrilled to win such a beautiful box and filled with such wonderful treasures. What a sweet giveaway! I would love to be entered in the drawing. Love your choice of fabric to cover the box with. I would love to be entered in your drawing. I will be away from my computer for a few days to go to Iowa to be with my 83 year old mother as she has surgery. This box would be a great gift when I get back home. I may be at Festival tomorrow - but I cannot resist throwing my name into the hat for this darling little box of goodies. Love the box - please enter me in the drawing. How wonderful! Wow! I would have to say my favorite is the bag with the lavender. My favorite flower/herb. Would like to be entered in your drawing. please enter me in the drawing! he boxes are so lovely and the new Primrose Inn fabric is just wonderful! The box is so pretty. I would love to win it! I hope market was a great success. I wish I could have been there this time, but could not come because I'm knee deep in home schooling right now. I keep thinking of your advice that you gave me at market last year! "Put those kids on the bus, and ship them off to school." I think of this every day and smile! Take Care. What fun treasures you have collected! I would love to find a home for them. I would love to win one of your sewing boxes. What fun! Your fabrics are some of my favorites! The two of you are so talented! I love everything you do! Just beautiful. Please enter me in your draw. I'd love to win the sweet box! The goodies inside sound like fun. Wow, what a great prize. How generous, I just love it all and the quilt is fabulous. Another book I have to look out for. Lovely box and what sweet finds from your travel. Please enter me in your drawing. Thanks! What a most gorgeous box, please count me in the draw.I love boxes and have a assorted groupings in most rooms of my house. What a beautiful treasure box. What a beautiful box. I would love to win it and would treasure it always. Please enter me in your contest! 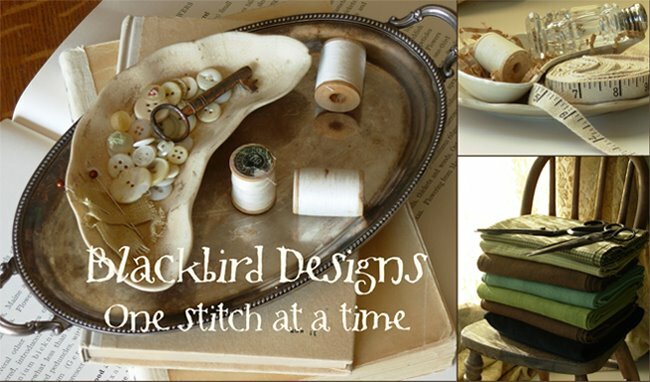 I am working on Blackbird Designs Summer Jubilee! Oh I sooo want to win this box! What an absolutely most fabulous prize. Thanks for doing this & offering it up for grabs! Oh! That box is lovely! I'd love to win one. What a lovely gift!! You are so generous. What a wonderful collection of goodies! My one experience of covering a box with fabric using spray adhesive resulted with my sticking my fingers together and my nails folding in on themselves and sticking... so I'd love one somebody else has made! The box is lovely and the contents are wonderful. What a treasure for some lucky person. What a great treasure box! Please enter me in your giveaway. Thanks for sharing "market" with us. Glad you're back and posting again. Missed hearing from you. Please put me in for the drawing. A yummy prize! Sure missed being at Market this time, but what a lovely remembrance you've put together. Thanks for the giveaway. What a beautiful box! Love the fabric you used. How beautiful. I would love to be entered in your drawing! This Box it is a dream!!! I would love to place it in my sewing room. That is an awesome sewing box. You are so creative. It would be wonderful to be the lucky winner. I love your "vintage" box! Please enter my name in your giveaway. What a fabulous giveaway -- how kind and generous! The box and contents...what a treat. I would love to win! Please enter me in the drawing. That is so nice. Love the box and the contents, please enter me in the contest! I so love your designs ,your giveaway is wonderful!! I am working on your wool Christmas runner from Home Sweet Hoem book, and am anxiously awaiting your new one. The box is beautiful, and I would love for it to come live with me! Thanks for such a great giveaway! Wow! Beautiful Box and fabulous goodies. You Blackbird girls are the best! Enter me for sure. How beautiful! What a lovely prize for someone... maybe me! The box is beautiful. I would love a chance. Thanks! What a beautiful box of treasures! Please add me to the list..
Really love the box and all the nice goodies! Please enter me in your contest! Also, have you printed the instructions in any of your books, which one? So glad you got home safe and sound! Love the box and would love to own it! What gorgeousness! Please enter me in the draw. I'd love to win - especially as it's my birthday! 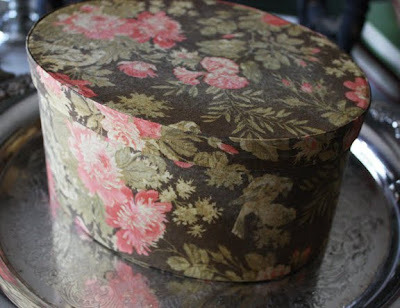 What a gorgeous idea to cover a box with a favourite fabric - not to mention all the goodies inside. there's such excitement in quilty blogland when Market comes. thanks for your pictures! The box is so pretty. Thanks for passing on the glue you used and that you lined the inside with paper! I'm just gonna have to try that! What a lovely box with such treasures inside...a perfect giveaway! What a treasure box!!! I would love to win this one. It reminds me of the box of goodies I saved as a child. A gorgeous box filled with such wonderful things! Please enter my name in your drawing. Love, love, love it! Please enter me in your new contest. What a wonderful box! Please show us how to make one sometime. The quilt is great. I got to see this in person today. Please include me in the drawing! The box is lovely and in the colors I love! So I hope you pick me...I love the quilt, too! Love the box. Please include me in the drawing. oh what a dream to win! what a gorgeous box! the box is beautiful with lots of lovely treasures. I'd love to win. How exciting! The box you made is lovely! Also love the selection of goodies you are including in the lovely box! What a beautiful box of sweetness! That quilt is amazing. I'll add my name to the list but it is a long one. Would love for that pile of Market Goodies to come down under. I hope I win the box!! What a lovely box and contents! Please include me in this Draw.Thank you! I cannot make all of the beautiful Blackbird Designs if I live forever. Such inspiration! !Thank you. Please enter me in the drawing. I feel I have already won just by being able to see all of the great things you come up with. 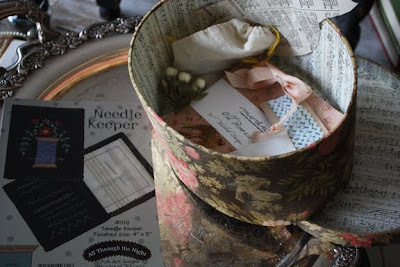 What a pretty sewing box and the goodies are just wonderful! Please include me in your drawing. Glad you had a wonderful time on your travels. Thanks for your great drawings. It all looks sooooo good. The fabric, the box, all is beautiful. But ....... I am very curious about the buttons, great with the lavendel. I just do love buttons. It was so nice to see your booth here, gave me the feeling I was there. Thank you so much. Wonderful Box and sewing assortment. Please enter me in your drawing. Beautiful BOM quilt, thanks for sharing the links, its so fun to find new places to browse. Please include me in the drawing! The beautiful box and it's treasures are amazing!! such lovely treats - Hope I'm the lucky winner! lovely box and beautiful quilt. Please enter me in the giveaway, thank you so much for such a generous offer! The album quilt is beautiful. Please enter my name in the drawing for your "Goodie Box." you sure are going to spoil someone - and i hope it's me!!! the fabric choice is stunning! i promise i can give it a good home! What a wonderful box!! Beautiful block of the month, too!!! Gorgeous box Alma. You are so very clever. Please include me in the draw. Thank you. What a wonderfully generous giveaway.I would love to be in the draw. Oh how lovely!! I would love to win one of these. Thank you so much for the opportunity. how to resist this wonderful contest: thank you for entring. I'm from Russia. Can you enter me in the drawing? Dear Alma, really beautiful, the box that you've made. It is zo kind that you give all this beautiful things away... to people that you don't even know... Thanks for your giving soul... I wish there were more people on this world like you, we all should give away a bit more! Pick me! BTW one of my co-workers brought me a copy of Halloween 1904 from market and ya'll autographed it for me - THANK YOU!!! oh the box is adorable and would look wonderful on my dresser filled with my own little treasures. will be fun to go thru and see the goodies inside one by one that you included. I find the box lovely. I like to enter the drawing. What a lovely prize with so many unusual gifts. Imagine opening that parcel - bliss! I'd love to be entered please. wow what a month you had indeed, not a bit less busy than mine just a lot more fun I think! Thanks for including your overseas readers in your contest. A beautiful box of treasures would be a welcome treat from "home". Wauw, you turned the box into a real beauty, I'd love a chance for winning it. Thanks for all the inspriation on your blog! The box is gorgeous and the goodies inside too !!! Hope I'm a winner !!!! Lovely ! Please enter me ! I would love to win one of your beautiful boxes. love seeing the pictures from the market!! Thank you for the giveaway! As ever - the things you make and design are gorgeous and I would love to be entered into the draw for the beautiful box. What a wonderful way to personalise a box and make it special for someone! I can imagine using all sorts of fabrics to suit the occasion. Thank you for telling us how you did it. Love that quilt. This box is so nice! And I love the new fabric collection! Everything you've gathered here is so lovely and inspiring, how do you do it? It's a gift! Thanks Alma for sharing your stories and pictures. Such wonderful inspiration! Amazing prize, you are so kind. Please enter my name into the draw. Many thanks. I think you do the best giveaways! I would love to win sometime. Wonderful !! thank you for sharing with us, even overseas !!!!! That's a lovely sewing box. Please add my name to the draw. Please enter my name in this drawing!!! The box is lovely!!! And all the pretty trinkets inside!!! Wonderful box! I love it, please count me in. Love to enter the contest, what a beautiful box! Would be proud to display it in my home... so keeping my fingers crossed for luck. Thank you. Maybe my luck is changing -- throw my name in the hat... great fabrics...nice giveaway thanks. How special it would be to have a beautiful box filled with all those treats. The quilt is stunning. Ohhh what fun! I can't win if I don't jump on board...so please throw my name in the hat and thank you for your generousity. Oh I hope I win. I am still hoarding my Nell's Flower Shop fabric, which I adore and have not thought up the right project for yet.